Photo 1 shows ‘Burgo’ before rebuilding commenced. The loco is my first in 16mm and was built in 1999 from a Roundhouse Lady Anne chassis and boiler kit plus a scratch built body. The loco’s full name comes from a Roman fort which was located on the military road from Eboracum (York) to Olicana (Ilkley) in what is now Adel. In my imaginary history it is an important archaeological site giving some welcome traffic to my line. In reality the site is under a field just off the A660 near the Parkway Hotel. Photo 2. The Riverdale boiler and a number of the parts which come with it – footplate, cab back (under the boiler), grate/ashpan, inlet and exhaust tees, brackets to hold servos and batteries, electric fan for raising steam, smokebox crossbar and packets of nuts, noozles etc. Not shown are a number of other bits mainly to do with the electrics/remote control eg battery box, switch and charging socket etc. Riverdale don’t supply bits which you need from Roundhouse so I’ve needed to remove from the old boiler, the safety valve, pressure gauge, lubricator lid and cladding. Photo 3. The loco was completely stripped down and this photo shows it on the first stage of rebuilding with frames back together, rewheeled and the motion back in place. At this stage there is still a frame stretcher missing. I took the decision to do a quicky rebuild in order to get experience of the loco running. Once I am happy with it, a further strip down will take place so that I can carry out a thorough repaint. The Roundhouse exhaust from the cylinders originally went up the chimney. Riverdale suggest shortening the original pipes but as I had new pipe in stock it seemed easier to replace them – their length now matches the inlet. Photo 4. Cylinders back on the frames and the inlet and exhaust tees in place. The one at the top of the picture is the exhaust with the pipe coming forward and going up through the frames where it will go into the smokebox – if you are confused it’s because the frames are upside down! The inlet points backwards where it will connect with the main steam pipe which runs underneath the boiler. Photo 5. Riverdale footplate and Roundhouse smokebox base on frames. Cladding from old boiler now on the new one – I intend to put some thin insulation between the two when I do the final rebuild. The aluminium section at the front of the boiler is the smokebox which slips inside the Roundhouse outer. It has to be sealed so that the blower and exhaust can create a partial vacuum to draw the fire. The blower and main steam pipe can be seen coming out of the fitting at the top back of the boiler running down the side of the firebox and disappearing under the boiler (the main steam pipe runs via the lubricator). Photo 6. This shows the right hand side of the engine with the batteries in place held in a frame above the footplate. Underneath on the footplate itself are the charging socket and the on/off switch. You can also see the main steam pipe which from the lubricator has had string wound round to lag it. Photo 7. The left hand side with the remote control equipment largely complete. The receiver on the left is a redundant 40 meg set left over when I converted my Cheddar Goliath to the Timpdon system earlier this year. My first choice would have been to use this system on Burgo as I much prefer the smaller handsets to any other RC system. Unfortunately, however the Timpdon system won’t operate all three servos in the manner I need for this particular set up. Since the photo was taken the framing has been cut down slightly to enable the receiver to sit lower down to within the profile of the side tank. The reverser servo is sat next to the receiver and is virtually invisible behind the servo in front of it, if you follow the reverser arm linkage running in front of the receiver you can just see the horn and top of the servo. 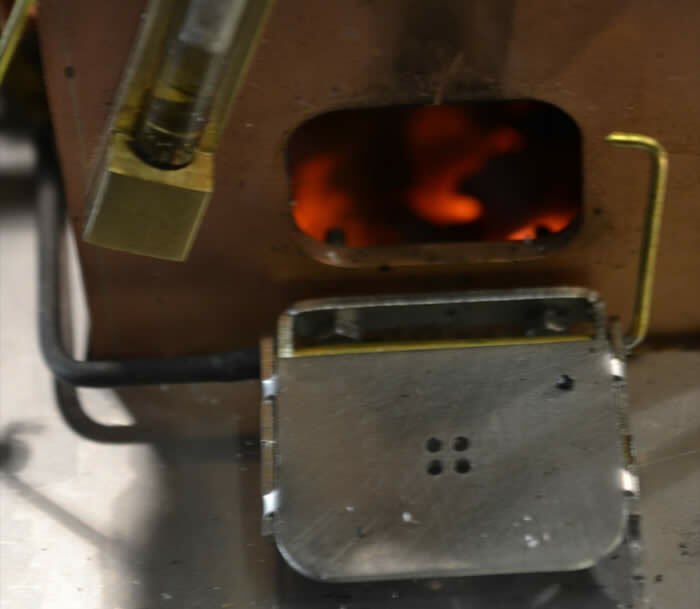 The servo in front opens the firehole door to control the fire when running and will also operate a Regner whistle which I have yet to obtain. The final servo is to the right and operates the regulator. Photo 8. 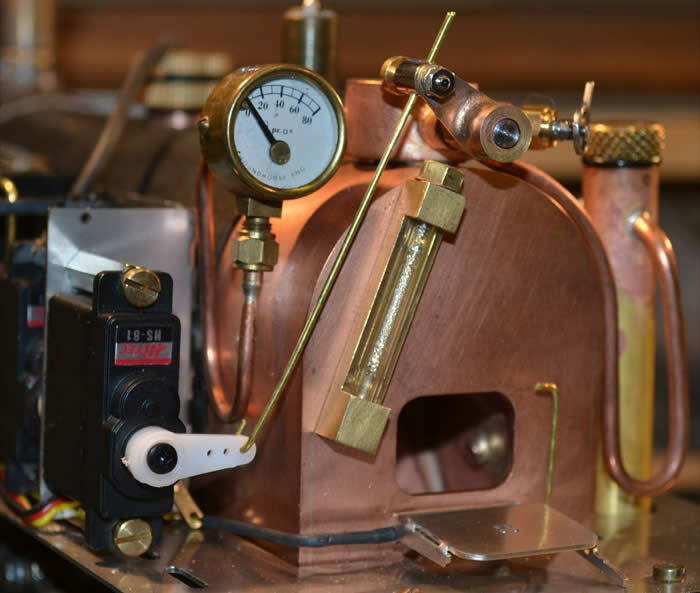 The regulator servo and linkage are plainly visible to the left. The linkage running to the firehole door can also be seen. The door is pulled fully open. When running it is pushed to and the remote control enables the door to be opened slightly which admits air and cools the fire to prevent blowing off. If more steam is required the door is fully shut causing the draught to come through the fire. Also visible to the right of the regulator is the blower valve. Photo 9. More or less the first fire. Numerous steamings over several days on the rolling road in my garage (door fully open!) then took place. Various teething problems were overcome. The least amusing was a piece of charcoal I had broken up and used for lighting up which proved to be incapable of actually burning once the paraffin it was soaked in had burnt off! The engine’s first run outside was on Steve Smith’s Aireside line and there is a link on this website to Andy's video of it. After some problem getting the fire going the loco ran really well and once I had learnt to turn the blower off whilst running being economical with both water and coal,. My thanks to Steve, Andy for his support on the day and to Trevor for letting me borrow his already wet stock so mine could stay nice and dry!